Cross posted from the VitalObjectives Blog. 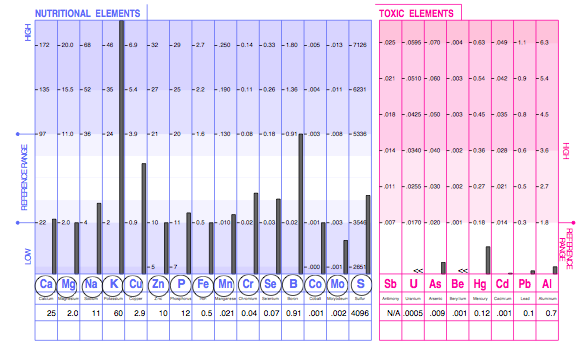 Toxic metals are bad. We don't want them stored in our bodies. If they are, we want to eliminate the source (e.g., amalgam fillings, environmental sources), and help the body get rid of whatever is stored. Here are two examples of laboratory assessments of nutritional- and toxic minerals using hair samples. 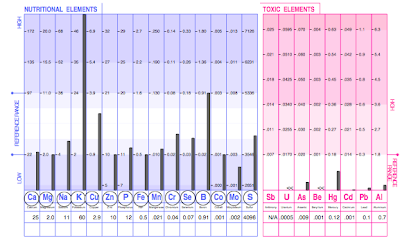 My question to the reader is who (person A or B) is having the worst toxic metals problem. 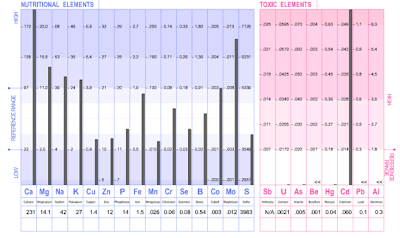 In each case, toxic metals are presented to the right and nutritional mineral to the left. 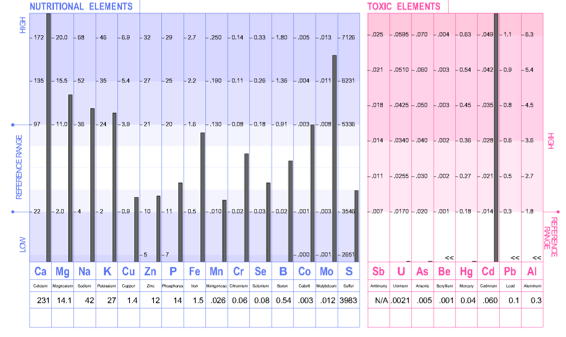 By the method that most health care practitioners read lab results, it is quite obvious that person A, with the high cadmium has the worst problem, whereas person B has an expected (due to the mercury fillings) but low elevation in mercury. This is totally backwards. The proper reading of these charts is that person A is far better off than person B. Person B, on the other hand is low in virtually all nutritional minerals (K, potassium can typically be ignored on this type of test). We also know that his dental fillings should supply enough mercury for it to show much higher readings if his body had enough nutritional minerals for the task of moving it out of vital tissues. What likely happens instead that the mercury from his tooth fillings end up in his brain-, or other tissues. Bad! So what do we do? We start working on getting person B's nutritional mineral deficiency under control. Do we recommend a multi-mineral supplement? So we will further investigate and deal with digestive- and gut issues before moving on to the mercury itself. It would be quite useless (if not dangerous) to target the mercury first. Doing so might just increase the amount that would wind up where he doesn't want it. The risk of causing real harm is imminent when lab values are taken at face value in a vacuum of ignorance about the patient. Unfortunately this is how most health care practitioners look at lab results.